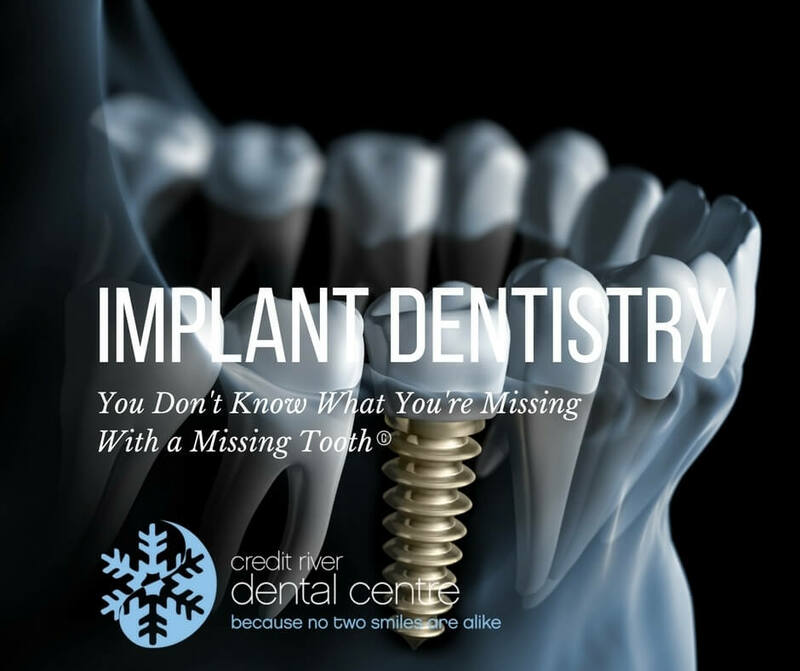 Dental implants are one treatment option that we provide here at Credit River Dental Mississauga that helps to replace missing teeth and allow patients to regain fully functional and naturally appearing smiles. Tooth loss can be caused by conditions such as tooth decay, gum disease, or trauma. As your Mississauga dentist, if one or more of your teeth are missing, we can help replace them with dental implants as an alternative to dental bridges or dentures to fill in the gaps caused by missing teeth. Dental implants create a smile that are not only extremely stable like real teeth but they also look and feel like your own teeth. Dental implants also keep the bone stimulated so that the bone does not diminish, which can create a 'sunken-in' look causing you to look prematurely older. Here at Credit River Dental in Mississauga we use dental implants made from titanium, which is very strong and biocompatible material. The implant is surgically placed where you are missing one or more teeth. After a few months of placement, the dental implant is allowed to heal until it is fully integrated and fused to the jawbone. The dental implant can then be restored with either porcelain crowns, dentures, or bridges. Dental implants serve a number of useful purposes and is the preferred choice for tooth replacement in many cases. Firstly, dental implants will prevent the teeth next to the missing tooth from shifting to try to fill the space. Secondly, if your missing teeth are in a place that is visible dental implants will help you regain a beautiful esthetic smile. Finally, one of the major advantages that dental implants have over the other tooth replacement options is that dental implants stimulate the jawbone to prevent it from diminishing. As a result, a dental implant can withstand a bite force close to that of a natural tooth. Most healthy patients are candidates for dental implants so if you want to replace one or more missing teeth, ask us about dental implants. Dr. Lee can tell you more after a screening and evaluation process. In most cases we can both place and restore your dental implants here at Credit River Dental in Mississauga. In complicated cases we may work with an oral surgeon or periodontist to place the implants but Dr. Lee will ALWAYS restore the implants. If you live in the Mississauga area and want to learn more about how you can restore your smile with dental implants, Call Credit River Dental Centre to set up your consultation today.